“I think of them as grains of sand pushed up from the sea,” says Maryse Arseneau. I am in a kayak beside a breathtakingly dramatic shoreline where rusty red cliffs plunge into the Gulf of St. Lawrence and this is my guide’s lyrical way of describing the formation of the Magdalen Islands (Iles de la Madeleine in French.) 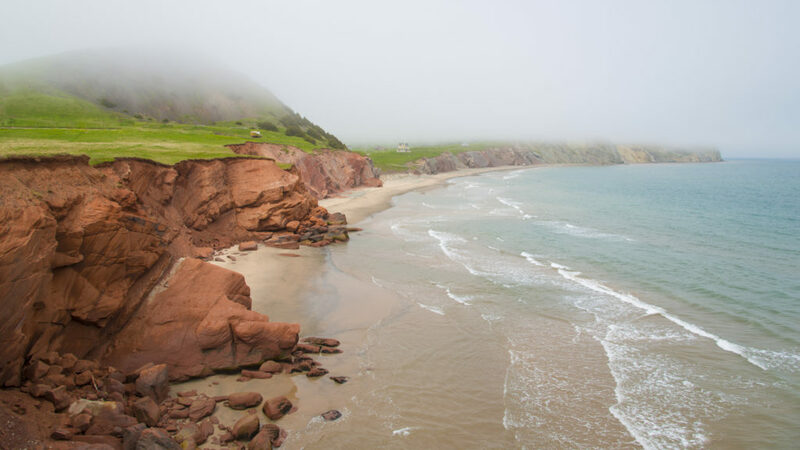 Although located in the middle of the Gulf of St. Lawrence close to Prince Edward Island, the archipelago of a dozen islands is part of Quebec. I’ve only been here a few days but their appeal is obvious. Food as fabulous as France, a countryside more pastoral than England’s, beaches as fine-sanded as the Caribbean, and outdoor adventures to set your adrenaline soaring. Although I must say, this day on the water is surprisingly calm. Many of the sports on Magdalen Islands are about harnessing the wind. In fact, it’s one of Canada’s best places for windsurfing – the Canadian Championships have been held here. There’s sailing, kite flying and power kiting where you ride a close-to-the-sand, parachute-powered dune buggy. Today, we put in at Parc de Gros Cap, a chubby finger of land with a campground, hostel and guided kayak trips, on Ile du Cap-Aux-Meules, the most populated of six islands that are connected by skinny sandbars. As our group of five paddles, Maryse, clearly in love with her islands, relates that sand covers about 30 per cent of them.Dunes are formed when the often-present wind blows the sand and the relentless pounding of the surf forms the gobbly-gook shapes that we marvel at along the coast. 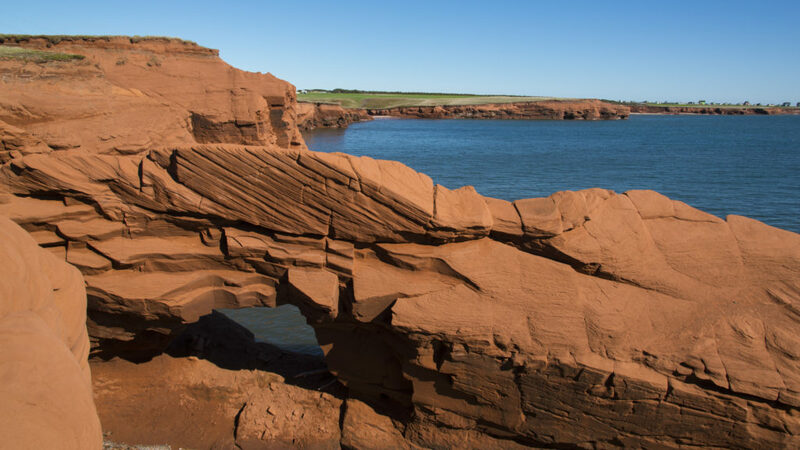 So, it is thanks to the wind and ocean that we kayak beside this convoluted shoreline where red limestone appears twisted and carved by an imaginative, master sculpture. Within moments of settling into our kayaks, we gasped at gorgeous columns freestanding along the shore. We followed out guides into spooky caverns to sniff dank air and, in dim light, glimpse glistening walls worn smooth by time and water. The only sound was the swish of our paddles. In another spot, we sat near a cave entrance to hear the thunderous sound of waves crashing into its depth. As well as a kayak excursion, this outing tested ones imagination. Time and again we checked out formations that, to one of us was an angel, to another a baseball bat. (This had to be one of those male, female contractions.) One famous sturdy free-standing column is named ‘the elephant’ however, the ‘trunk’ has fallen off so it needs a new moniker. We paddled around the cape, spotting black guillemot birds nesting on the cliffs, and into Echouerie Bay. Maryse relates the gory history that in the late 1700s walrus basked here but were slaughtered. She also tells of some of the horrendous storms that have ravaged this coast. Apparently, on this half-day, idyllic paddle, our group has experienced what the Madelinots call a ‘pet’ day – dead calm. That evening on the way to dinner, we stop at Millerand lighthouse to catch the sunset. “Look whales!” shouts one of my travelling companions. How perfect that in evening’s soft light, several Minke whale breach just off-shore. We stand in knee-high grass that ripples in the wind and revel in this tranquil Magdalen moment. It’s been a “pet” day, indeed. Previous articleWhat’s Your Wellness Travel Personality?